She had the proverbial lion by the ear, and could neither hang on nor let go. Her husband responded and quickly dispatched the mountain lion as she held on to it," the Idaho Department of Fish and Game (IDFG) described in a news release Monday. Ok, kudos to both the gal for hanging on to both savage beasts, and to her husband for having a gun handy and responding in time to his wife call for aid. This cat sounds like one that was barely older than a cub, but they can get really big up in that country. Do they get to keep it? Big cat. They get big up here, CW. I keep thinking that I'm seeing jaguar tracks, but I think that they're just big lions. That is not a 35 lb. mountain lion. 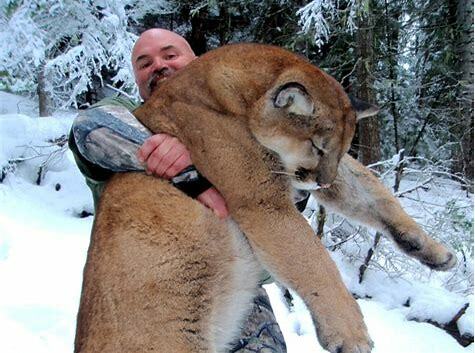 Agreed, the picture above is not the 35 pound juvenile mountain lion described in the Idaho Fish & Game press release. But, large adults can reach weights of 210 pounds.